Want to share the great taste of Sarabeth's Kitchen with everyone on your gift list? No problem! You can ship Sarabeth's items to multiple addresses with one single order—whether the recipients are around the corner or across the globe. And we'll automatically store each recipient's address in an easy drop-down list to make future orders a breeze. 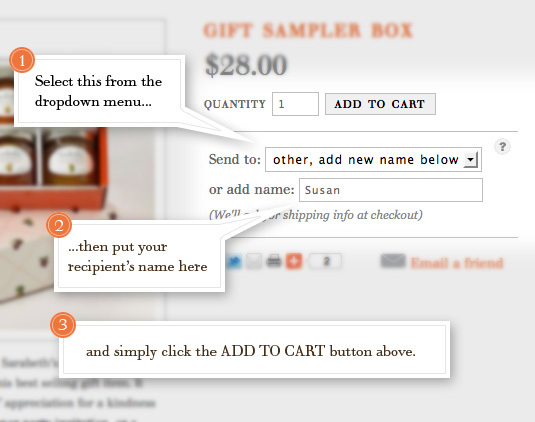 First, go to the full page view of the product you'd like to send as a gift. You'll see a drop-down menu labeled Send to. If this is the first time you're sending a gift to this person, select other, add new name below. We'll automatically remember the names of each person you send a gift to, so in the future you can simply select the one you want. Enter the name of your gift recipient in the available space. You don't need to give any more information just yet, we'll ask you for all the relevant shipping information later on. Finally just click the Add to Cart button. If you'd like to send several of the same item, make sure to increase the quantity number appropriately first. When you're ready to check out, you'll see that we've organized your order by recipient. You can now set up the appropriate shipping address for each person separately. When you're ready to proceed, just click Proceed to Checkout. If you've skipped anything, we'll just ask you to fill in any remaining blanks.